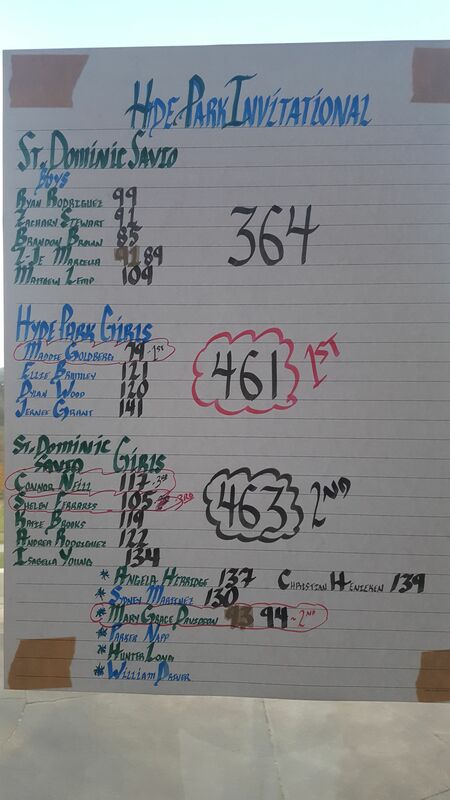 In an historic day for the Savio Eagles, the men's golf team claimed its first-ever tournament victory - or at least a first in a tournament of this magnitude. 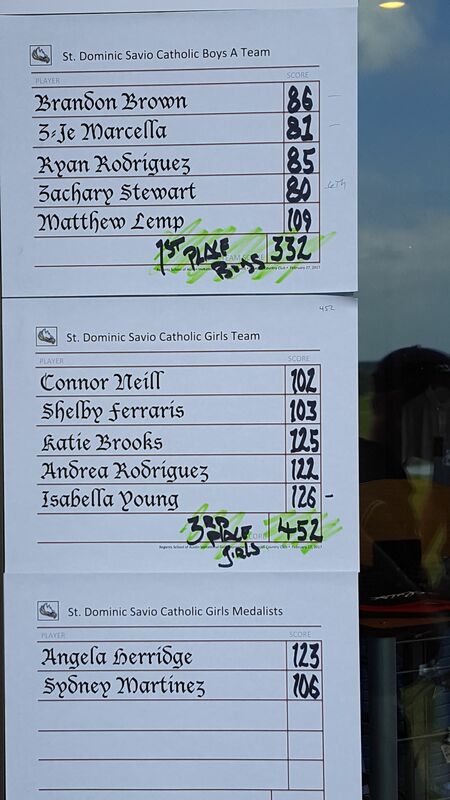 Savio's Eagles defeated seven other teams at Lakecliff Country Club, while the Lady Eagles held strong for third place among five teams. 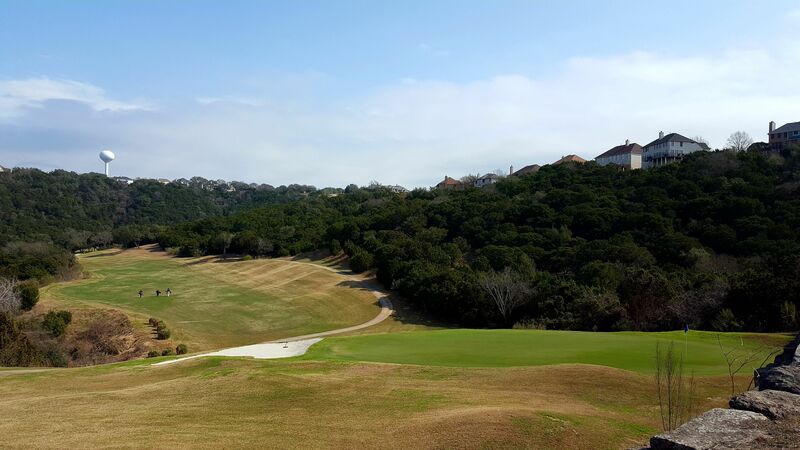 The results were definite improvements over the season's first tournament at River Place Country Club earlier this month. "Their finishes today are definitely a mark of their maturity and ability to bounce back, which is crucial in the game of golf," said Coach Jameson. Added Junior medalist Zach Stewart, "We were focused, determined, pretty calm... and [about winning] I wouldn't say surprised, but excited, and I knew we could pull it off." Stewart led the men's team, shooting 80 and earning 6th place medalist honors, while Sophomore Z-Je Marcella followed with 81. For the Lady Eagles, Senior Connor Neill (102) and Junior Shelby Ferraris (103) earned 6th and 7th place medalist honors, respectively. The Eagles and Lady Eagles will have plenty of time to sharpen their games prior to their next scheduled tournament - also hosted by Regents - on March 27. 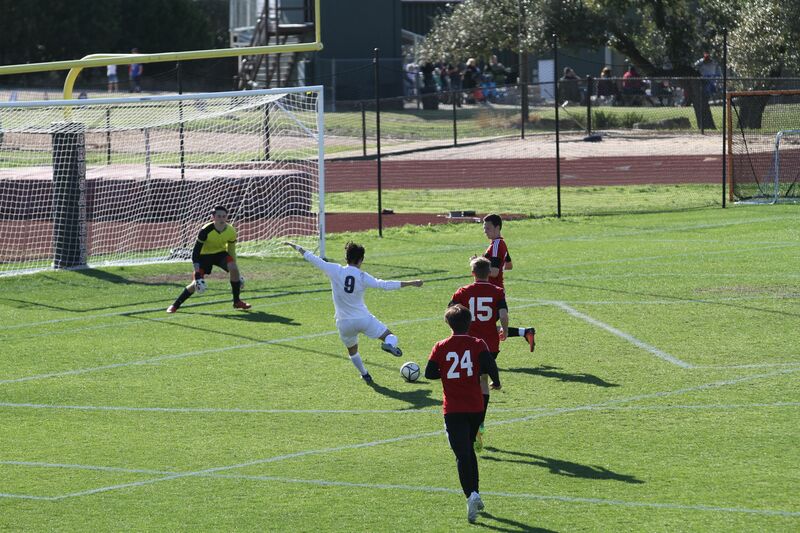 The Savio boys soccer team continued its record breaking season with a 3-0 win in the second round of the playoffs Saturday against Fort Worth Christian. 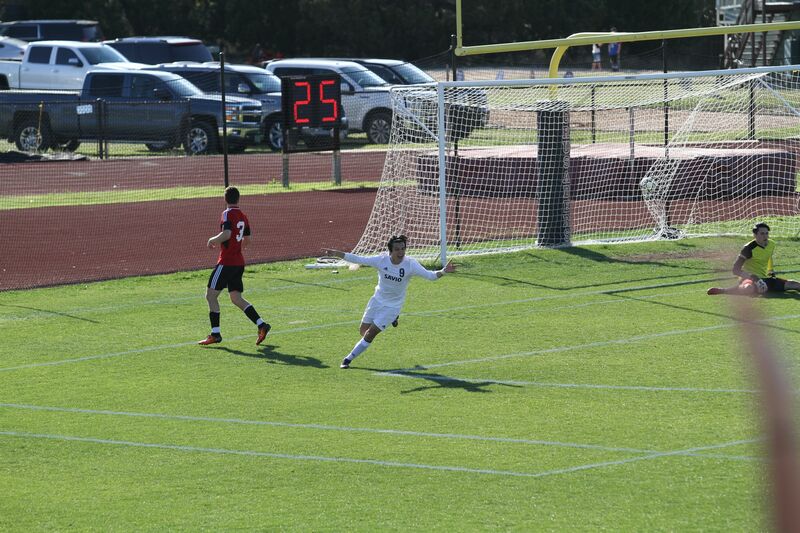 Savio opened the scoring 12 minutes into the game. Brendan Mazzurana made a perfect cross from near the corner over the keeper onto an onrushing Santi Sustaeta who headed it in. Savio continued to dominate the midfield play all game, but with two goals called back, and a Nathan French shot off a breakaway that hit the crossbar, Savio was still only up 1-0 until midway through the second half, then two more great passes by Brendan led to two more goals by Santi to put the game away. 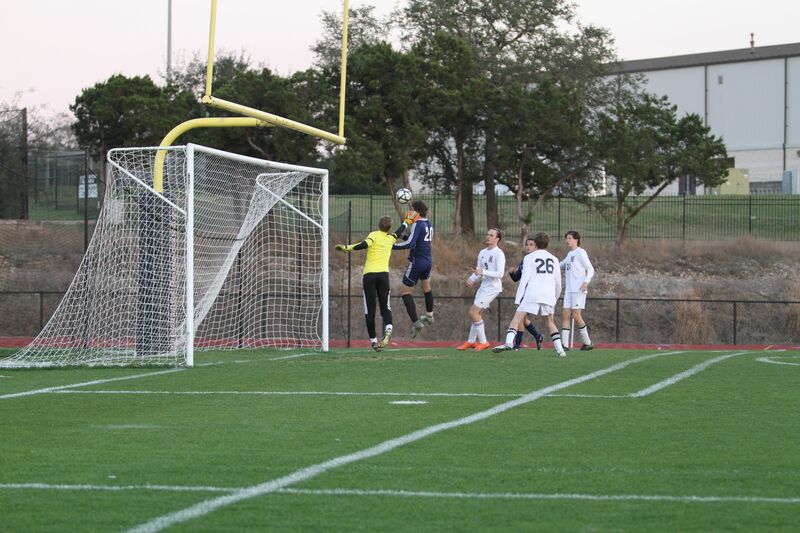 The shutout, the sixth for Cory Cady and the Savio defense, beat the previous Savio record for most shutouts in a season (5 by Luke Rivas in 2014). 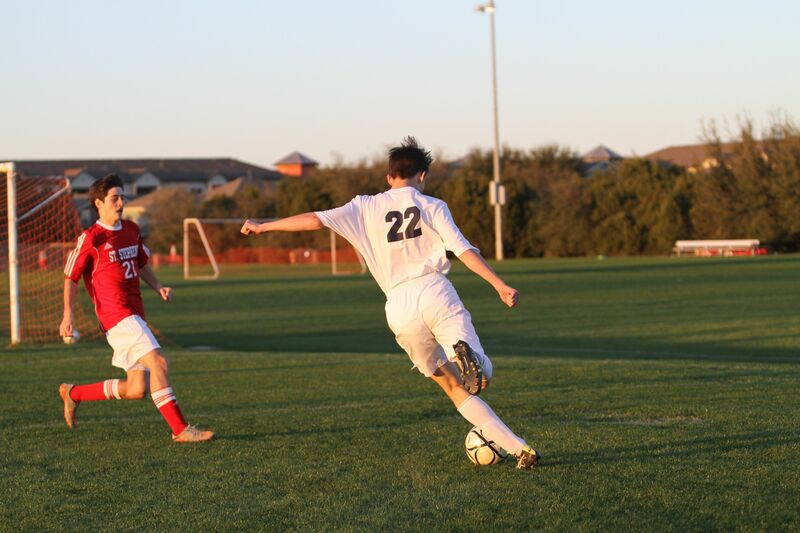 Freshman Brendan Mazzurana's three assists also brought his season total within one of the Savio record for most assists. 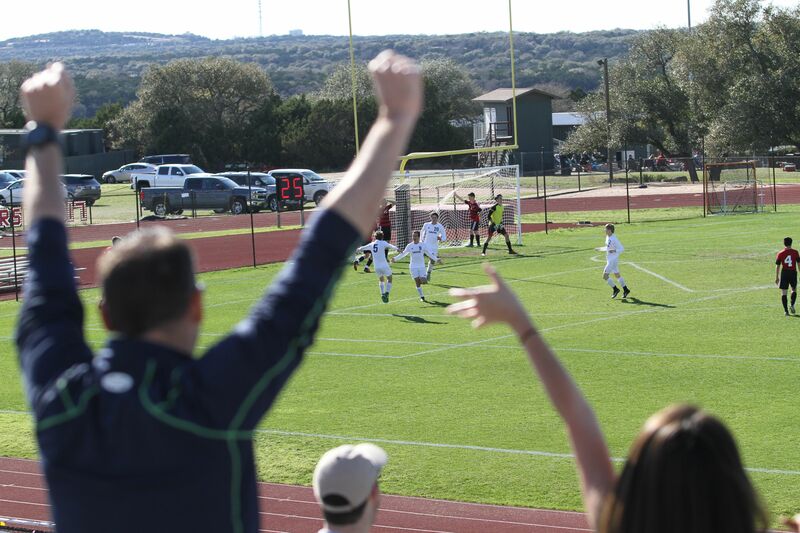 Savio's 3-0 win extended their season record to 15-2, their best year ever, and Savio continues to be ranked #1 in the state among TAPPS Division 2 schools (by Maxpreps). Savio will play the winner of NE Texas, Bullard Brook Hill, in the Regionals (the quarterfinals of the State Tournament) on Tuesday at 6pm at Robinson High School (south of Waco, TX). 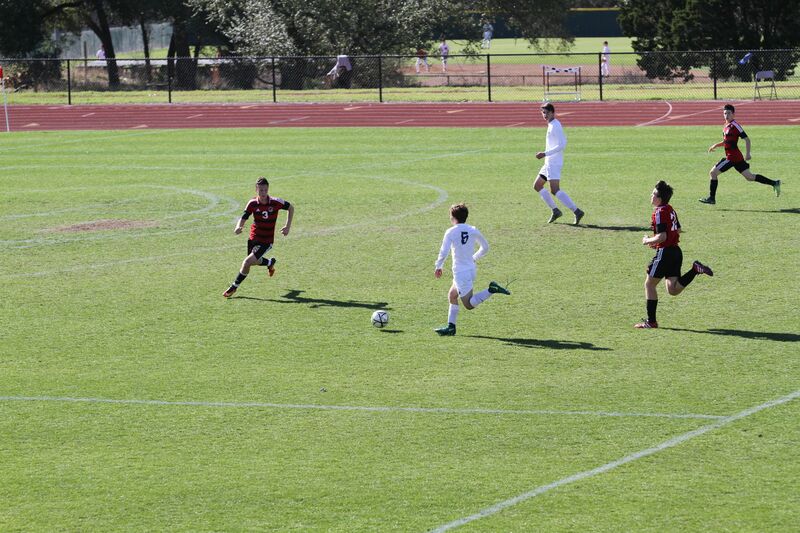 Brook Hill is one of the most successful boys soccer programs in TAPPS history, having reached the state semifinals seven times, and the finals two years ago. It should be a great game! 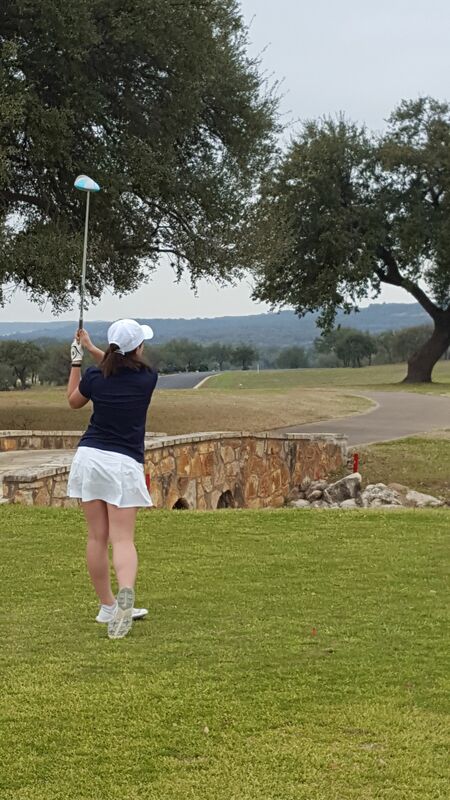 Savio's Eagles and Lady Eagles golf teams competed in the Hyde Park Invitational at the challenging River Place Country Club on Monday, February 13. The Eagles faced especially tough competition against Hyde Park - whose Ben Constancio shot an impressive 2-under 69 to lead the men's medalists - along with Regents School. 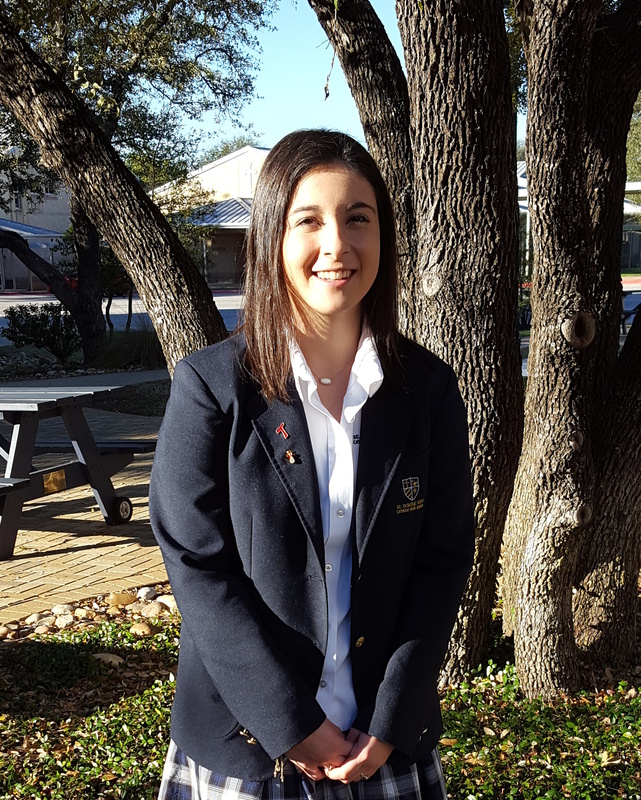 Special accolades were awarded to the Lady Eagles' Shelby Ferraris, who earned 3rd-place medalist honors amongst the women with a score of 105. 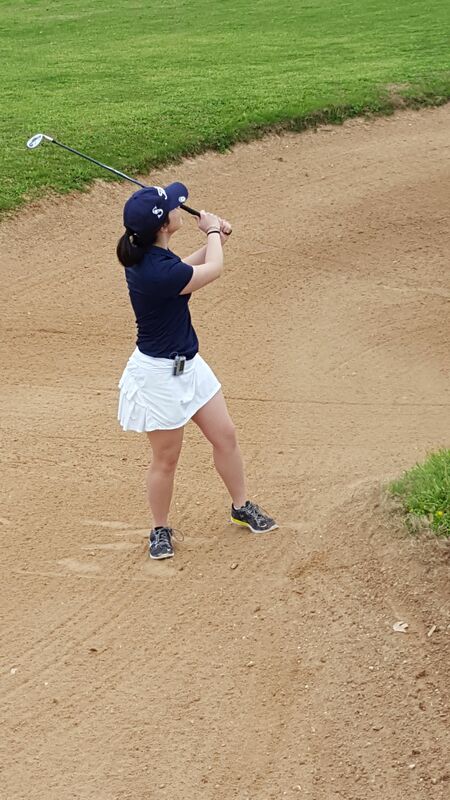 The Eagles and Lady Eagles did a fine job of shaking off the rust in their first tournament of the season and look forward to finding the fairways and greens at the Regents Invitational on Monday, February 27. 93 St. Dominic Savio Catholic High School students and many community members donated their ponytails during the Cuts for Cancer event last Friday. All 93 beautiful hair donations will be sent to Pantene® Beautiful Lengths to create wigs for cancer patients that have lost their hair from treatment. Each hair donation included a minimum of eight inches of hair. Pantene® Beautiful Lengths is part of the largest, national movement and that creates free, real-hair wigs for women with cancer. Hair provided by generous donors will be crafted into beautiful wigs that cancer patients can wear comfortably. This year, students and community members raised $2200+ at the event that will be donated to St. Jude Children’s Research Hospital to help fund childhood cancer research. Visit the link to view the Savio Filmworks Team video capturing the event. 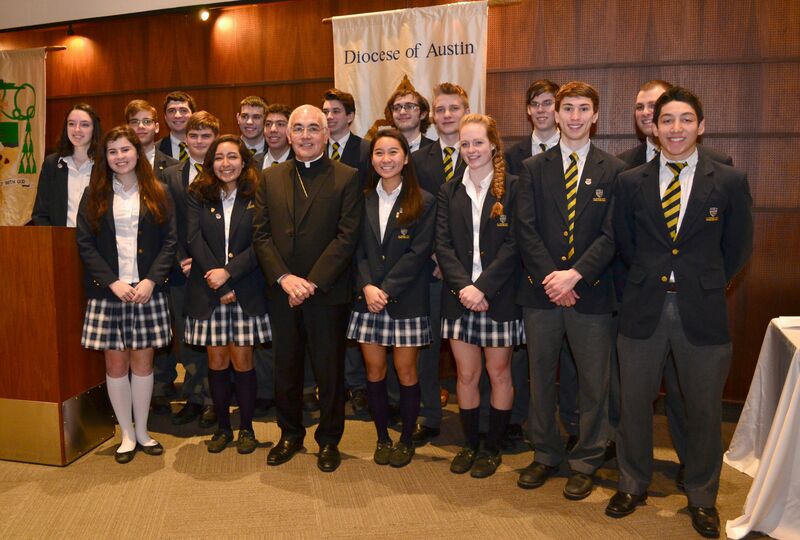 Yesterday, Savio’s 18 National Merit Scholars were invited to the Diocese of Austin Pastoral Center to attend a reception with the Diocese of Austin Bishop Joe Vásquez. Bishop Vásquez expressed his commendations for those receiving National Merit recognition in 2016. On Thursday March 2nd immediately after school there will be try-outs for the Savio TAPPS State Academic team in room A101. Any Savio student is welcome to try-out, whether they have previously competed in an academic meet or not. Students may try-out for as many events as they wish. The top two scorers in each event will represent Savio at the state meet at the Waco Convention Center on April 4th & 5th. Events include: Advanced Math, Calculator, Current Events & Issues, Literary Criticism, Number Sense, Science, Social Studies, Spanish, Spelling & Vocab and TAPPS Math. 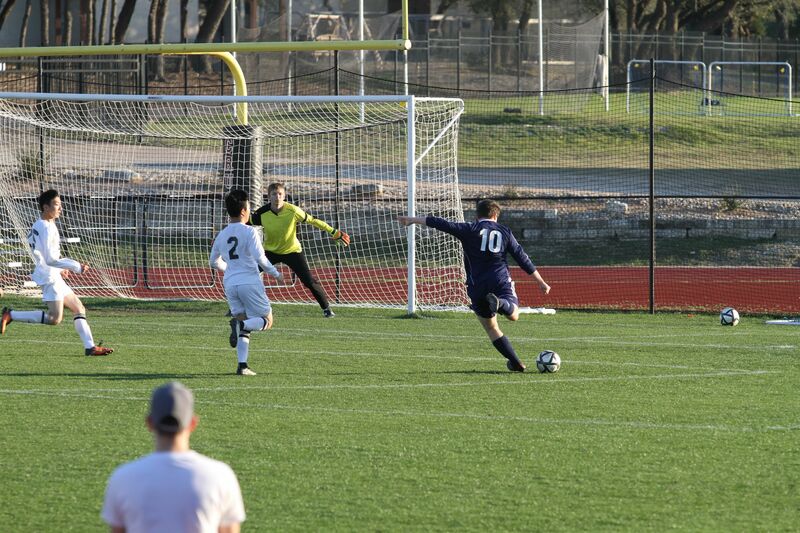 Savio closed out district play with a convincing 4-1 win over St. Michael's to stay undefeated in district play (6-0) and extend their season record to a remarkable 14-2, best ever for Savio soccer. Fifteen minutes into the first half Cian McGetrick scored off a pass from Chris Gonzales, and then St. Michael's quickly evened the score on a long shot. 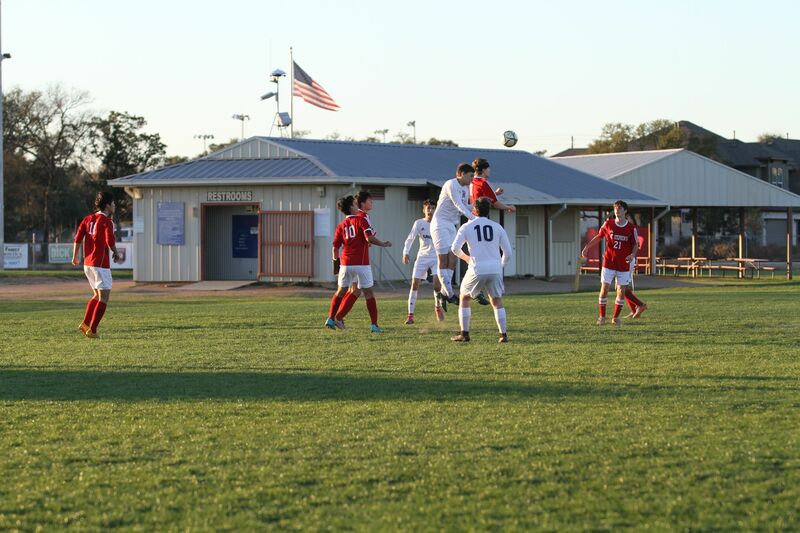 Then with five minutes left in the half a Chris Gonzales corner kick found Nathan French near the front post but his header was saved by a defender, but Nathan put his own rebound in for Savio to take the lead. 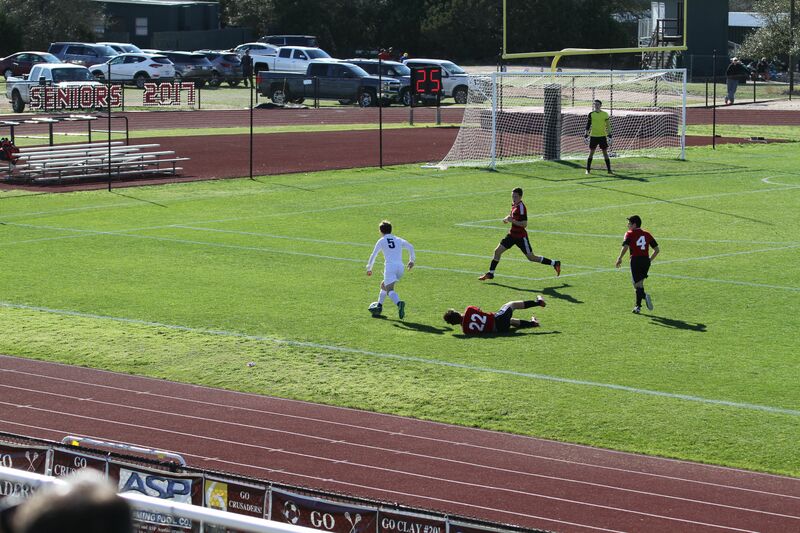 Savio scored again just before the end of the first half, with a pass from Brendan Mazzurana to Chris Gonzales in the goal mouth who put it in to have Savio up 3-1 at half. 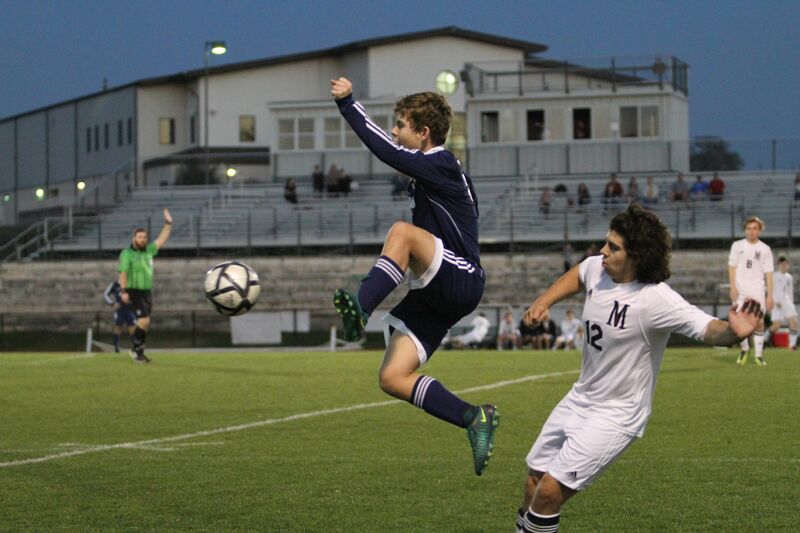 Midway through the second half Mitch Romero put the game away with Savio's fourth goal. 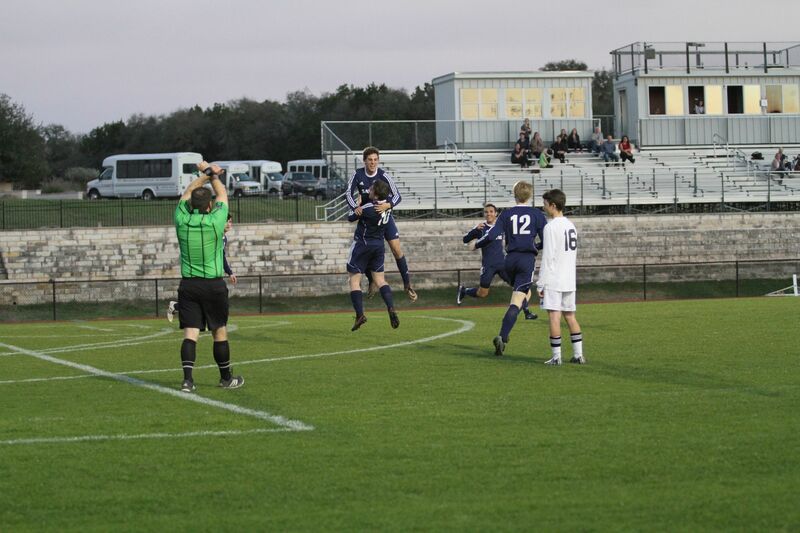 It started with another amazing long throwin from Preston Noonan to Nathan in the center of the box who passed to Mitch who shot perfectly to the corner of the goal from 10 yards out. 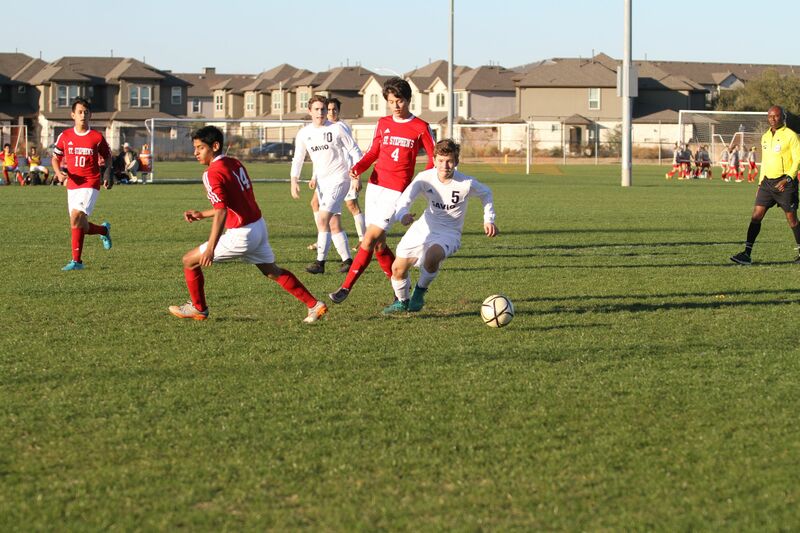 Savio was helped by another good game by the senior defenders. After the game the team honored the 10 seniors on Senior Night. On to the playoffs! Savio starts with a bye and will host the winner of a 1st round game to be determined later this week. On Saturday, the Savio Eagles Boys basketball team played in Midland against Midland Christian School Mustangs in the TAPPS Div. 5 Bi-District game pulling off an upset victory 66-63. This week, Savio is celebrating Crush Week to promote healthy relationships as our students grow closer to choosing their paths after High School. On Monday, Chris Sperling, a licensed Marriage and Family Therapist at The Intuitus Group, gave a presentation to educate our students on what it means to have healthy, Godly, relationships in all aspects of their lives: from sports, to classes, to friends and family. 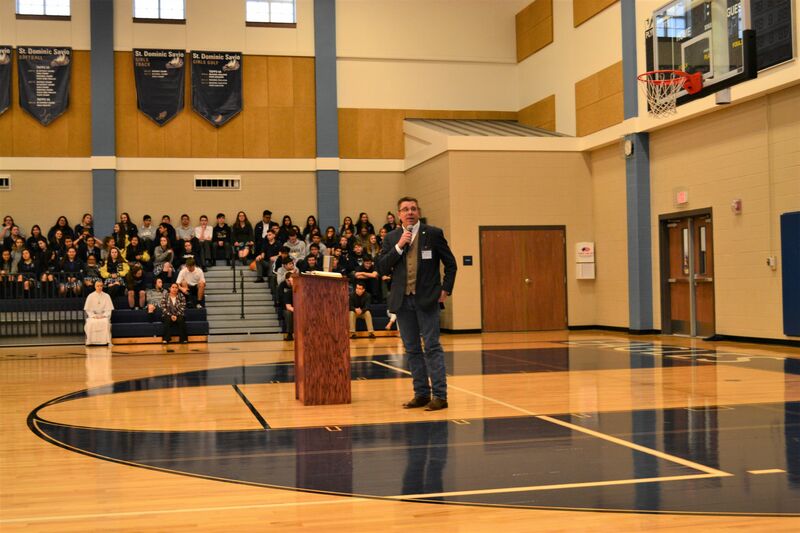 Mr. Sperling referenced the book of Tobit throughout his presentation to inspire students to pray about what God has in store for their lives through the people they know. Mr. Sperling also challenged the students to work on their relationships and friendships to focus on the needs others may have rather than focusing on themselves. On Tuesday, St. Valentine’s Day, faculty and students passed out Crush sodas to those that received one from another student. Students could pay $1.00 to arrange for a Crush soda to be distributed to a classmate or choose to pay $2.00 to keep the gift of their Crush soda anonymous. All proceeds of the Crush sodas go toward lowering the cost of Prom. 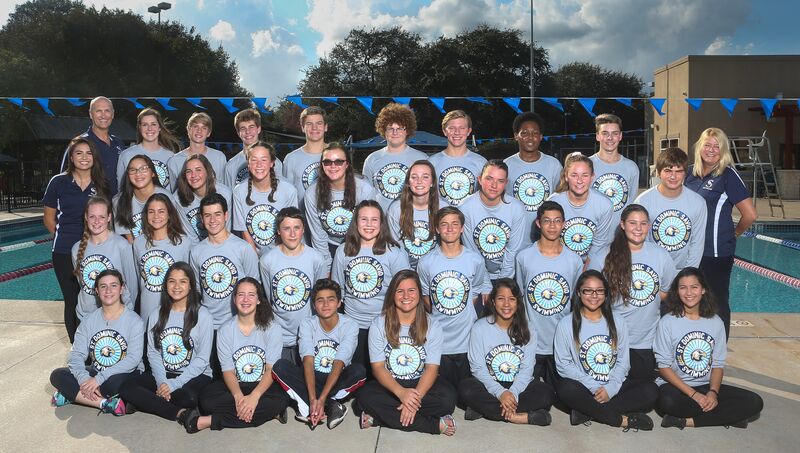 Congratulations to the Savio Swim Teams! Both the girls and boys won state surpassing second place by a margin that was almost equal to the total points they scored last year! For meet details and individual results, click HERE and HERE! To view video footage of the Girls 200 M Freestyle 1st place win click HERE. To view video footage of the Girls 200M Free Relay 1st Place win click HERE. To view video footage of the Boys 200M Freestyle Relay 1st place win click HERE. 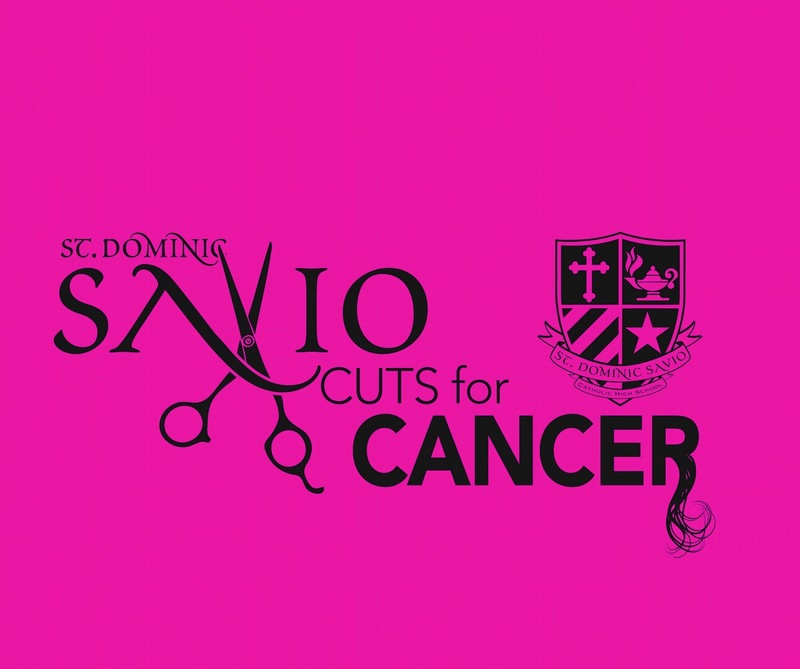 Join St. Dominic Savio Catholic High School students and many others as they donate their ponytails during the Cuts for Cancer event on Friday, February 17th at 2:30 pm in the St. Dominic Savio Gym. All beautiful hair donations will be sent to Pantene® Beautiful Lengths to create wigs for cancer patients that have lost their hair from treatment. Each hair donation must include a minimum of eight inches of hair. Pantene® Beautiful Lengths is part of the largest, national movement and that creates free, real-hair wigs for women with cancer. Hair provided by generous donors will be crafted into beautiful wigs that cancer patients can wear comfortably. The students and those that will be in attendance on Friday, February 17, will be encouraged to support cancer research. This year, all donation proceeds will be donated to St. Jude Children’s Research Hospital to help fund childhood cancer research and care. St Dominic Savio is looking for ladies and gentlemen to participate by donating their hair. There is no age limit and we invite friends and families to participate. “My grandma… had cancer and didn’t survive, it made a giant impact on me because before I didn’t realize how big of a big deal cancer was and how it can [physically] destroy people who have it." Join us for this significant event on Friday, February 17th at 2:30 PM in the St. Dominic Savio Gym (9300 Neenah Avenue, Austin, TX 78717). Consolidated Chinese Programs of Central Texas, consisting of the Chinese programs from 10 high schools, had a Chinese Culture Fair on Jan. 21, 2017. 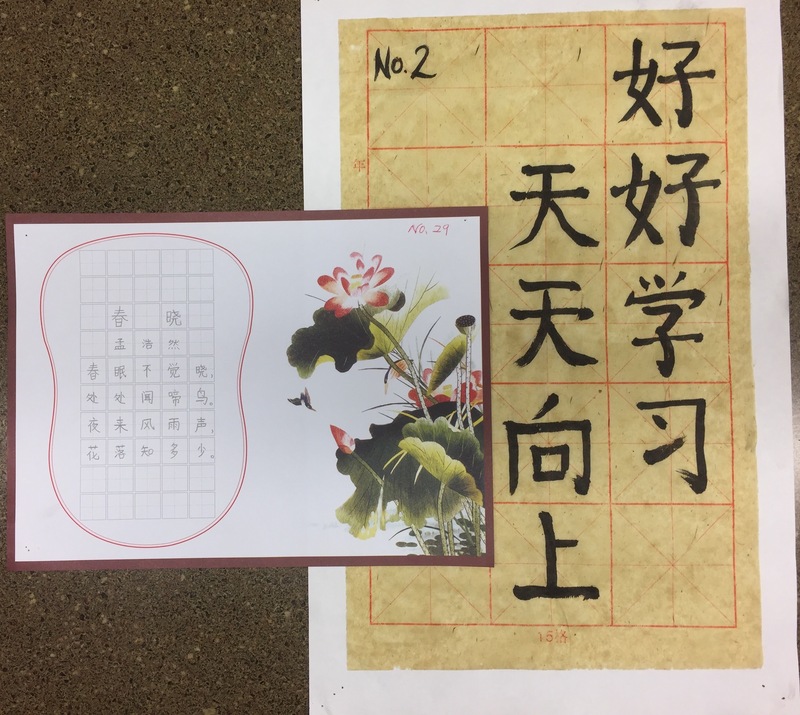 Savio students participated in the competitions of Pen calligraphy and Brush Chinese calligraphy. Andrea Poblete & Julianna Wydra: The first place of the combination of Pen & Brush. Congratulations to all the students above! On Friday the 2nd, another day, another shutout ... three in a row for goalie Cory Cady and the Savio defense: Mitch Romero, Cameron Henry and Patrick Miles. 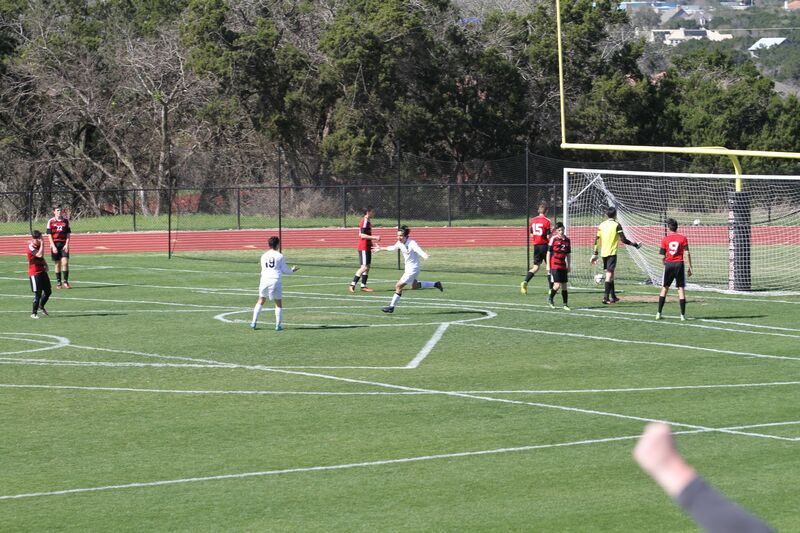 A great performance by the Regent's goalie frustrated Savio's offense all day. 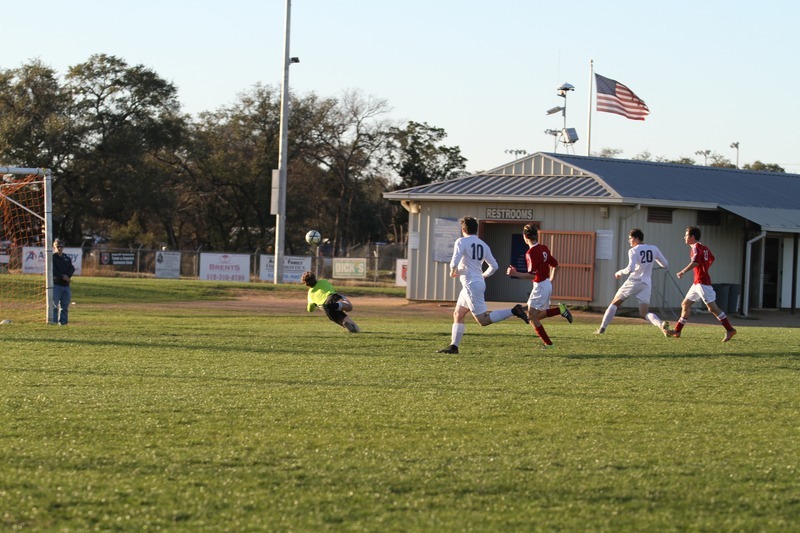 Savio dominated much of the game and had more shots on goal, but it all came down to an exciting PK shootout, after a 0-0 tie in regulation. 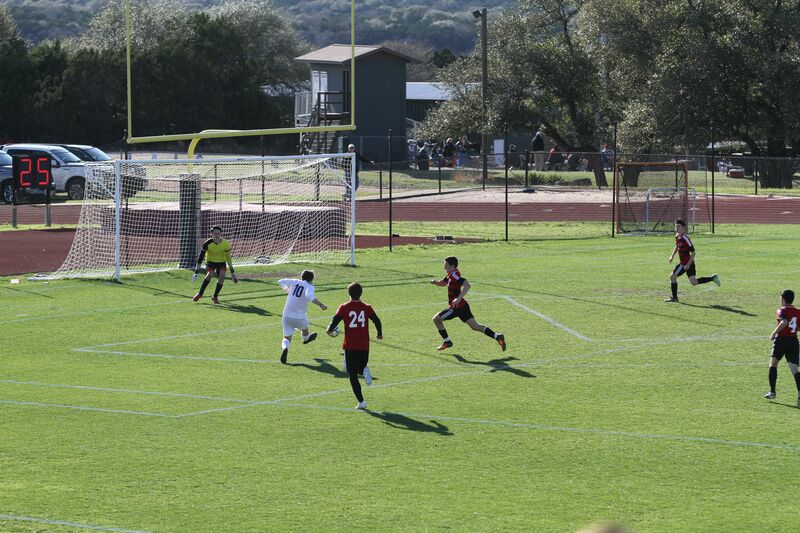 Savio won the shootout 3-2 with some nice saves by Cory, and penalty kick scores by seniors Preston Noonan, Santi Sustaeta, and then Cian McGetrick with the dramatic final shot drilled past the Regent's keeper for the win in the shootout. 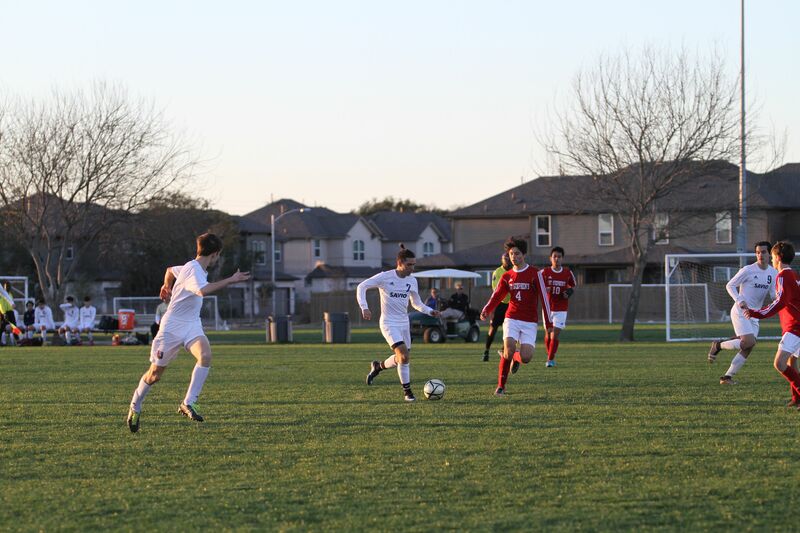 Then on Friday the 9th, Savio had a come from behind win, beating Hyde Park 2-1 after falling behind early. 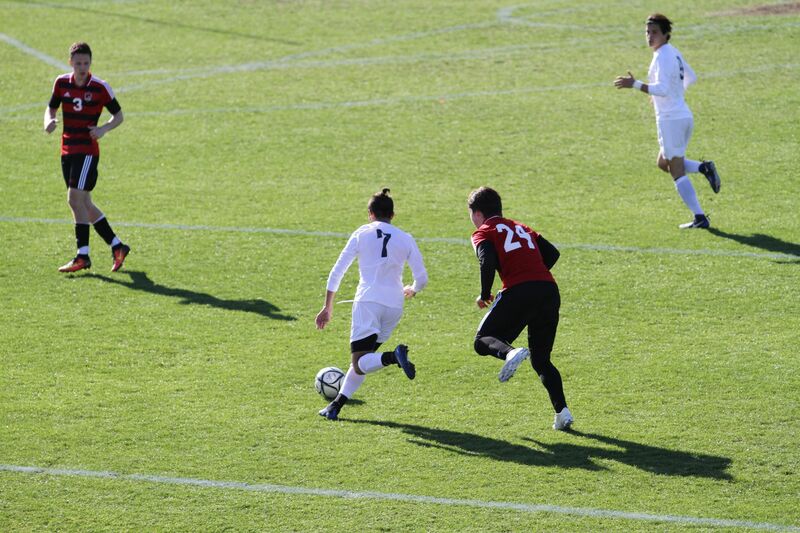 Late in the first half Kyle Gonsalvez scored with a nice shot from 20 yards out off a pass from Luc Nguyen, and midway through the second half, Chris Gonzales passed to Joseph Figliozzi who flicked it to Nathan French just past midfield. 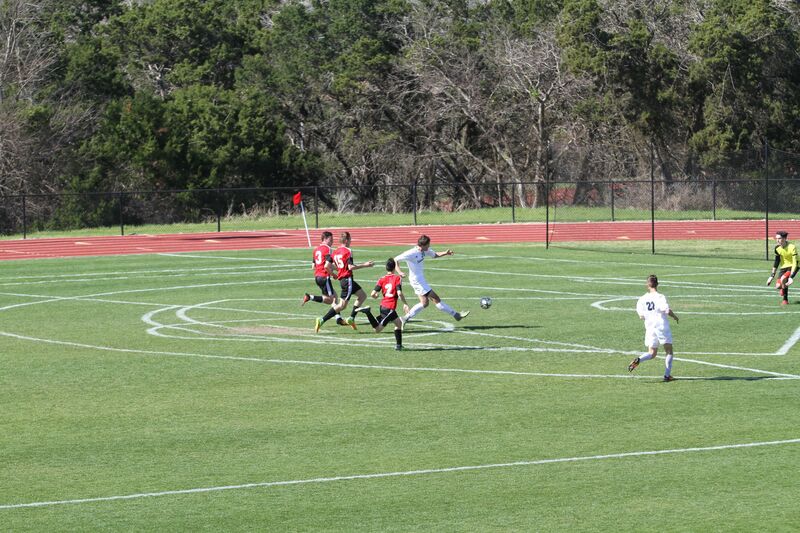 Nathan took the long breakaway all the way, dribbling around the keeper and shooting for the winning goal. With the wins, Savio clinches a playoff spot and 1st place in district and keeps its top ranking in state (in TAPPS Division 2 according to maxpreps), with one district game to go. 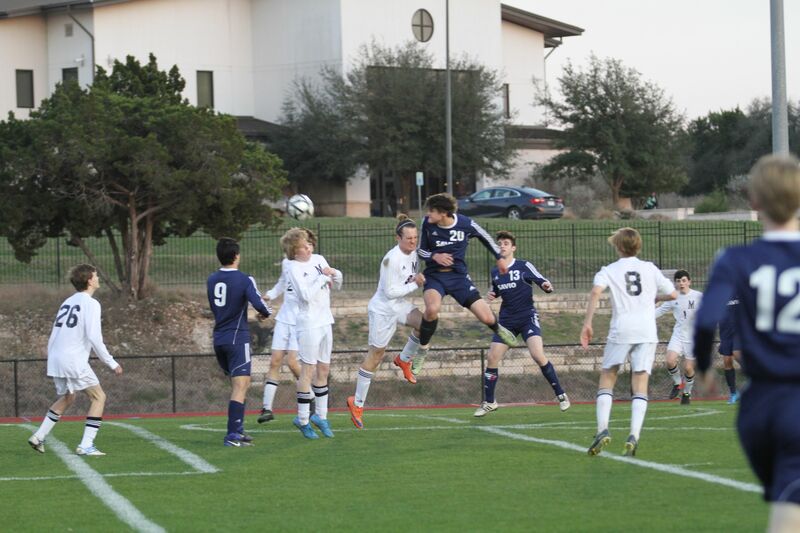 Savio's overall record is now 13-2. Next game is at St. Michael's on Friday at 5pm. Bryn Stryk, and her Irish Sporthorse, Lola, pictured above, competed at the United States Hunter Jumper Association, Southbound Winter Show, held January 20-22 at the Extraco Center in Waco. The duo participated in the $3000 Medal Classic jumper class at 3’8” which consisted of 15 jumps and combinations. After a clear timed round, Bryn and Lola advanced to the jump off and placed second in this division for Reserve Champion Jumper. Bryn, a Junior, is the daughter of Bob and Darlene Stryk of Schulenburg and is a member of the Fayette County 4-H Horse Club. Bryn was also in the Fort Worth Stock Show Equine IQ Contest in January and placed third and won an $8,000 scholarship. A Savio Alumna, Sabrina Mari Uriegas Class of 2015, is working on a musical locally, where she received the lead role as Maria in the West Side Story musical. The show will open at the Georgetown Palace Theatre on February 17th through March 26th with show times on Fridays, Saturdays at 7:30 pm and Sundays at 2:00 pm. For more information and to purchase tickets click HERE. 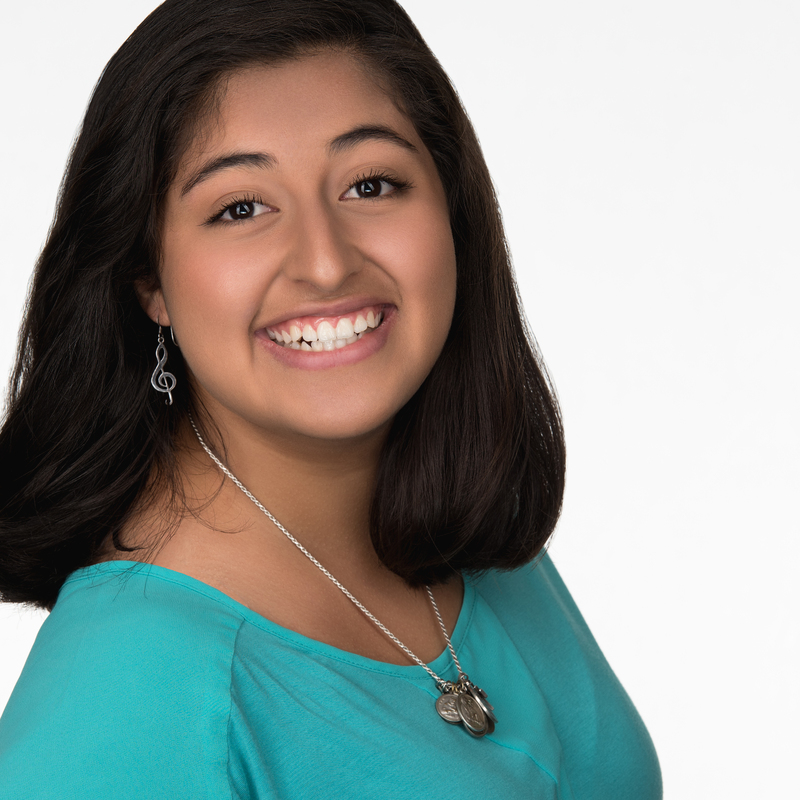 Currently, Sabrina is studying Choral Studies at The University of Texas at Austin. Apart from that, Sabrina has also continued her love of music by teaching music to young children with UT's String Project. She continues to keep up her acting and singing experience by auditioning and participating in musicals around the area. Sabrina’s favorite part about being able to bring this timeless story to life is working with such an amazing, talented, and loving cast and crew. She enjoys communicating the story in a special way and sharing a bit of herself with the audience to tell the story. I believe the performing arts is a medicine that heals people. I desire to serve and heal people and bring them joy through my performance. I am also inspired to praise God through my performance. Savio truly shaped me into the woman I am today. Savio gave me confidence, strength, love, dreams, and endless opportunities. I cherish all it bestowed upon me and I am blessed to have this community, family, in my life. When life seems difficult and there's no light to be found, the light will shine through and reveal a resolved good, better than you could imagine. God has wonderful plans for you. Sabrina hopes to see you sometime at the Georgetown Palace Theatre on February 17th - March 26th. I pray all is well for everyone and hope to see you there! Come say hi after the show whether you know me or not. 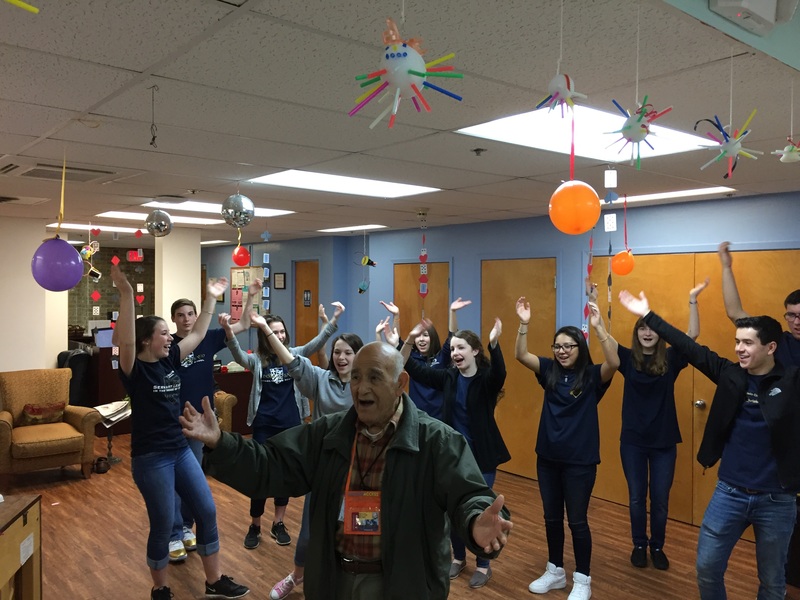 On Thursday, February 2, 2017 St. Dominic Savio students stepped out of their comfort zone at school and visited many organizations / service sites in the Georgetown, Round Rock and the greater Austin areas. The students served in designated groups of 15 to 30 students in mixed grade levels as they served the community. 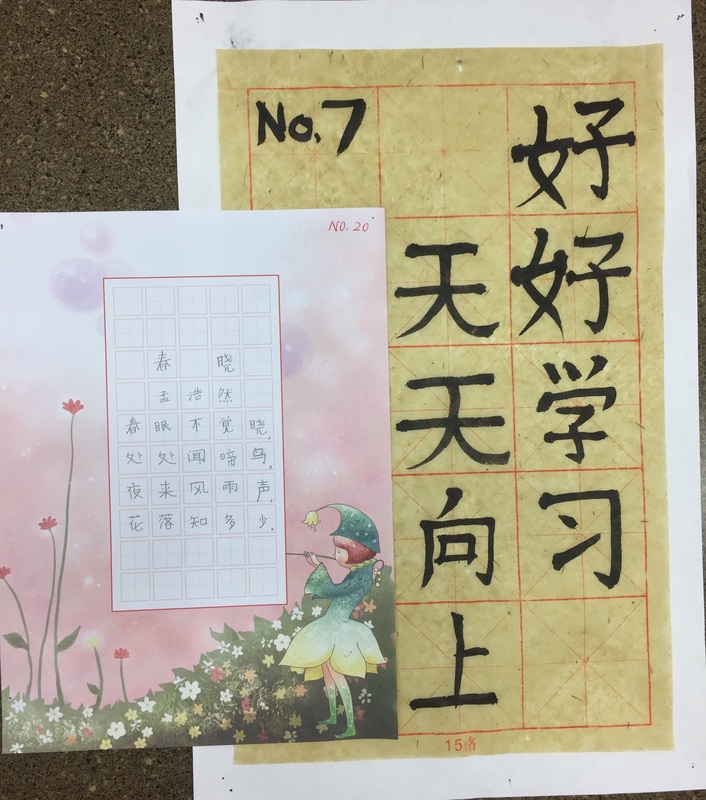 The tasks that the students were asked to complete varied based on the location. Some organizations asked the students to complete service projects like painting a fence or clean a space outside. While others were asked to spend time with children or the elderly as they painted together or played games. Each location asked the students to help in different ways exposing the students to different experiences and needs in our communities. 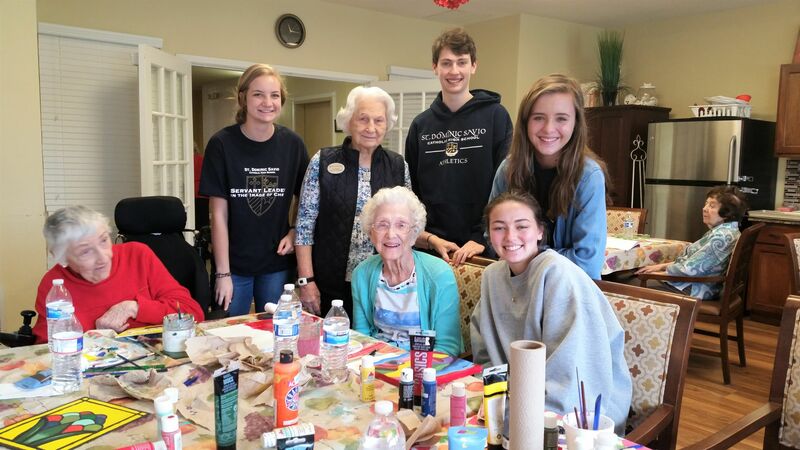 Some of the locations that the students served were Age of Central TX Adults in Round Rock, Williamson County Animal Shelter, Capital Area Food Bank, Brookdale Retirement home, Round Rock Serving Center, Casa Marianella, Habitat for Humanity, Ronald McDonald, the Annunciation Maternity Home and many more. Each group visited one location from 9:30 AM to 12:30 PM. The total number of service hours for student, faculty and staff that participated, amounted to over 1,130+ hours! One parent wrote in to express their gratitude on behalf of their family for the Imago Christi Day experience. Thank you to everyone that participated in this service opportunity to help the needs of our community. Our very own Alana McKendall signed an athletic scholarship offer to run track at Loyola University New Orleans today. Alana has participated in track at Savio for all four years and was part of the 2015-2016 TAPPS 4A State Championship team. Alana received 1st Team All State honors in the 4x100M Relay and Honorable Mention in the 4x200M Relay last season. We are so very proud of her as she moves on and we know that she will continue to have great success both on and off the track. Goalie Cory Cady, and the Savio defense (Patrick Miles, Mitch Romero and Cameron Henry) shut down St. Stephen's to preserve Savio's fourth shutout of the year, and second in a row. 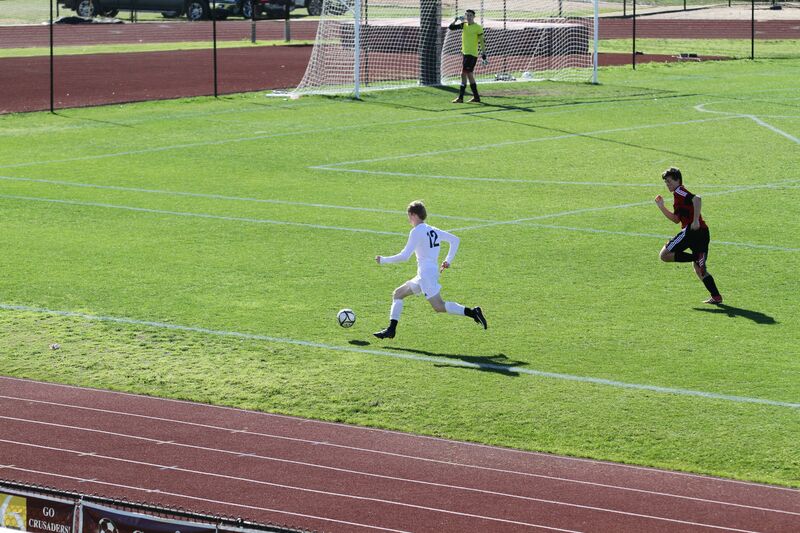 After a scoreless first half, two minutes into the second half, Kyle Gonsalvez passed a nice ball to Freshman Joseph Figliozzi who put a perfect sharp angled shot from the corner over the St. Stephen's keeper into the goal for the win. 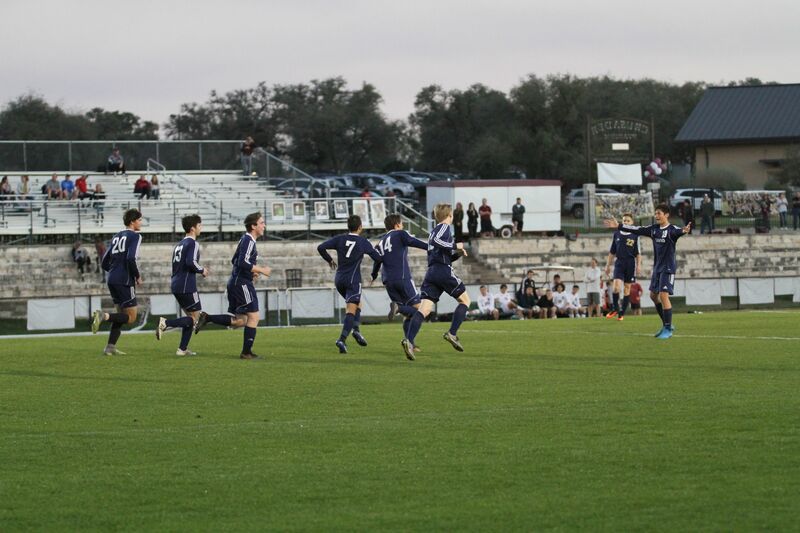 Savio is 11-2 and has won six in a row (best ever for boys soccer). 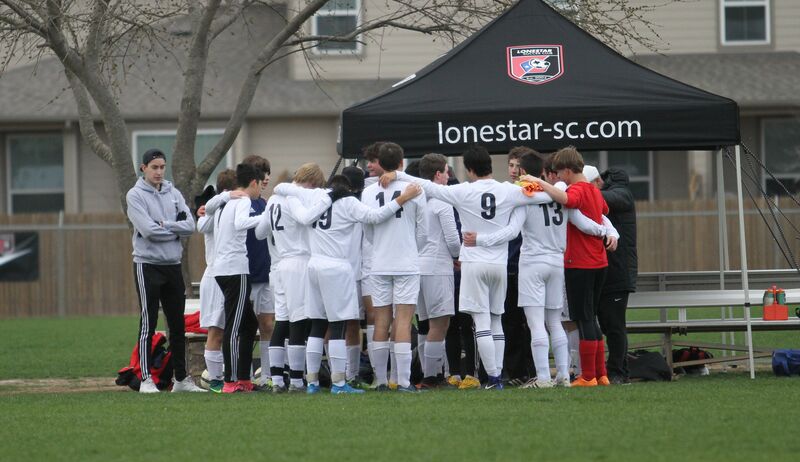 District play resumes with the next game, 5pm Friday at the Town and Country Soccer complex. Iron Eagles Advance to the Regional Tournament! 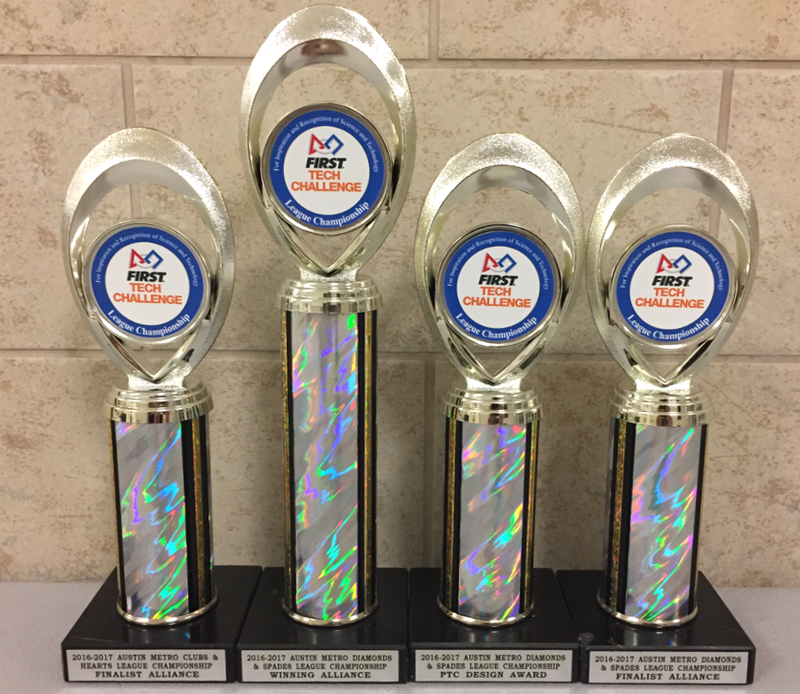 On Saturday, Jan. 21, Savio’s four Iron Eagles Robotics teams competed in the first Austin Metro League Championship. This was a new event for the area’s FIRST Tech Challenge (FTC) teams, as our region moved to League play for the first time. Starting in November, the Austin area’s 52 FTC teams split into four leagues of 13 teams each to form the “Austin Metro Leagues” (Spades, Hearts, Diamonds, and Clubs). 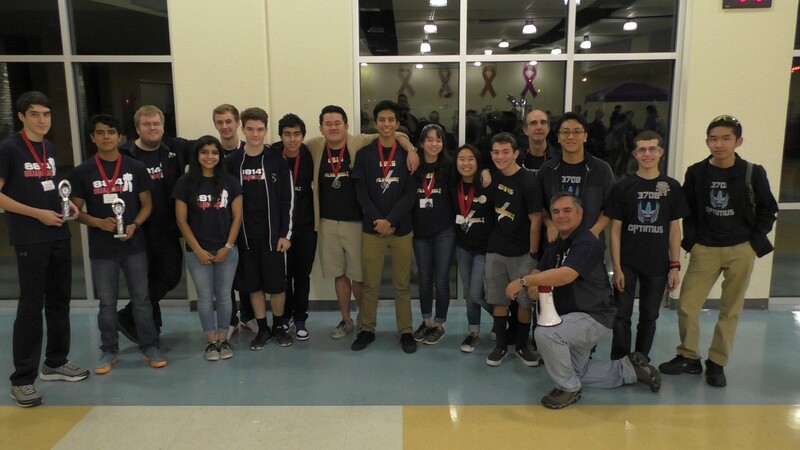 After 3 league meets (one of which was held on Jan. 7 at Savio, for our first hosted robotics tournament ever! ), the four Iron Eagles teams needed to bring their “A” game to the League Championships, which determined the 16 teams to advance directly to the Alamo Regional Tournament. Entering the tournament, the Iron Eagles teams all held competitive positions within their leagues. The two Leagues were randomly combined into two divisions of 22 teams each - in the “Hearts/Clubs” division, Iron Eagles Prime was ranked #5 and Iron Eagles Optimus was ranked #12, while in the “Spades/Diamonds” division, Iron Eagles Silverbolt was ranked #6 and Iron Eagles Guardian was ranked #11. Team Prime opened for the Iron Eagles with their best day yet, shocking the competition by winning all five of their matches to move up to #1 in their division! Meanwhile, Team Optimus struggled through some mechanical failures throughout the day, struggling in their first four matches against some very tough competition. But they finally got it all together in their last match, where they joined their sister team Prime to help put them into first place! Optimus scored big in their autonomous program to start the match, and the “Optimus/Prime” alliance cruised to an easy 110-20 win in both teams’ final match of the day. In the Spades/Diamonds division, Team Guardian started off strong with a win in their first match before losing a few close matches (including a tight 15-point loss when they were forced to play against sister team Silverbolt). But they also came on strong in their final match, winning 120-20 to finish with a 2-3 record and dropping just one spot to #12 in the final rankings. Meanwhile, Team Silverbolt scored high in all of their matches, but dropped 2 games to the eventual #1 seed and to an alliance of two teams who were both ranked just ahead of them. Silverbolt actually gained on 3 of the teams that had been ahead of them, but also lost ground to two others and thus ended the day as the 8th seed in their division. The excitement peaked as each division prepared for the elimination rounds. In these rounds, the top four seeded teams select two other teams to form “alliances” that compete in best-of-three matches to determine the league winners. As the #1 seed in the Hearts/Clubs division, Team Prime was strongly challenged by the #2 seed from St. Gabriel’s, as they both strived to select the best teams available for their respective alliances. Both alliances won their semifinal matches 2-0, and then Prime split the first two matches in the division finals before falling in the third. In the Spades/Diamonds division, teams Silverbolt and Guardian had played well and were ranked fairly high, but had to wait and see if they would be selected by one of the top-seeded teams. As luck would have it, Silverbolt was selected to join the powerful #1 alliance, led by Vandegrift’s QuadX team, while Guardian was asked to join the #2 alliance led by Vandegrift’s Hydra team. As in Prime’s division, both top alliances won their semifinals 2-0, which set up a showdown in the finals between Silverbolt’s and Guardian’s alliances. Silverbolt’s #1 alliance was then able to defeat Guardian’s #2 alliance 2-0 to win the division. As members of a Winning Alliance and Captain of a Finalist alliance, both Silverbolt and Prime were guaranteed advancement to the Regional Tournament. Guardian needed things to break their way during the awards ceremony, where they won the Rockwell-Collins Innovation Award for the 3rd consecutive season and placed second for the PTC Design award. Along with being the 2nd pick of a division Finalist alliance, that was enough to advance them to the Regional Championship as well! Unfortunately, Team Optimus’ seven-year record of advancing to the Regional Championship ended on Saturday, but they will continue to work on their robot in preparation of a potential TAPPS competition later this year. And they will of course cheer on sister teams Prime, Guardian, and Silverbolt as they compete at the Regional Championship in San Antonio on February 23-25!